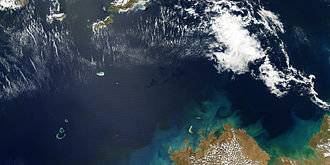 An oil spill is the release of a liquidpetroleumhydrocarbon into the environment, especially marine areas, due to human activity, and is a form of pollution. The term is usually applied to marine oil spills, where oil is released into the ocean or coastal waters, but spills may also occur on land. Oil spills may be due to releases of crude oil from tankers, offshore platforms, drilling rigs and wells, as well as spills of refined petroleum products (such as gasoline, diesel) and their by-products, heavier fuels used by large ships such as bunker fuel, or the spill of any oily refuse or waste oil. Crude oil and refined fuel spills from tanker ship accidents have damaged vulnerable ecosystems in Alaska, the Gulf of Mexico, the Galapagos Islands, France, the Sundarbans, Ogoniland, and many other places. The quantity of oil spilled during accidents has ranged from a few hundred tons to several hundred thousand tons (e.g., Deepwater Horizon Oil Spill, Atlantic Empress, Amoco Cadiz), but volume is a limited barometer of damage or impact. Smaller spills have already proven to have a great impact on ecosystems, such as the Exxon Valdez oil spill because of the remoteness of the site or the difficulty of an emergency environmental response. “It’s safe to say that there is no longer a norm of “basic” hair color. With an influx of fashion colors, we’re seeing rainbow, bright neons, and now The Oil Slick. FOR THE RECORD. The Mormon Church of Satan General Conference is this weekend. They’re feeling elated, invincible, on a roll, masters of the universe. The stock market closed high, almost sky high, but it’s a lot of hot air. Nothing can prevent the impending stock market crash, worldwide. Why am I still writing this “lunatic” “nonsense”? Because this “lunatic” “nonsense” is true. I write under inspiration from, and with authority from, God, the true God, Jehovah; no power on earth can prevent me from continuing to write this “lunatic” “nonsense”. I will continue to write this “lunatic” “nonsense”, until it actually happens, until the stock market actually crashes, GUARANTEED. Now as for those of you who’re awaiting word that I was sent to a hospital, a prison, a morgue or a “nut house”: CONTINUE WAITING, IN VAIN!